This week, Emory University welcomes the Class of 2021, a talented group of first-year students from all over the world. Along with duffel bags and dorm-room décor, they arrive with diverse stories of their academic journeys. For some, the chance to study at Emory has been a long-held dream. For others, the opportunity to attend a top liberal arts research university represents a never-imagined goal now being realized through life-changing scholarship support. 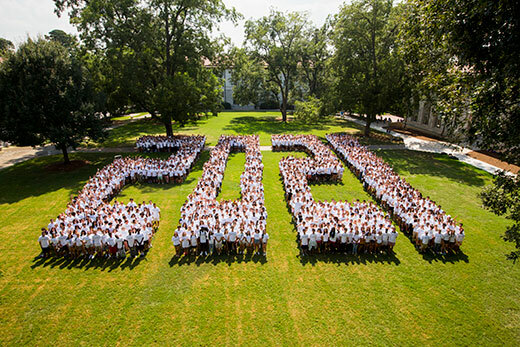 With top academic scores, athletic and artistic achievements, and community engagement experiences, the Class of 2021 was selected from among a record-breaking number of applicants. “In all the ways we measure academic preparation, this is a remarkably talented class,” says John Latting, associate vice provost for undergraduate enrollment and dean of admission. When applying to Emory University, the students had the option to choose between two paths: Beginning their studies in Emory College of Arts and Sciences on the Atlanta campus, or spending their first and second years at Oxford College on Emory’s original campus in Oxford, Georgia. After their sophomore year, students can choose to complete their undergraduate degrees in Emory College, Goizueta Business School or the Nell Hodgson Woodruff School of Nursing. Both Emory College and Oxford College experienced double-digit increases in applications for the Class of 2021. Emory College applications were up 19 percent to 23,747, and Oxford applications jumped 63 percent to 14,190. About 56 percent of applicants asked to be considered for admission to both colleges. Overall, applications arrived from all 50 states, as well as the District of Columbia and Puerto Rico, and more than 65 countries, by citizenship. The university also saw a rise in applications from African American and Latino/Hispanic students. Beyond the university’s growth in overall applications, this year’s applicants also raise the standard for academic excellence, with a jump in both grade point averages and overall test scores. Latting attributes the all-time-high number of applicants to Emory's ability to connect and communicate with more people. Of the combined incoming class of 1,886 students, some set their hopes on attending Emory College or Oxford College the moment they stepped foot on those campuses during their initial visits. A few already know their campus by heart. Others look forward to a broader discovery of Atlanta and the American South — an introduction to new foods and culture, a sense of community and geography that they’re eager to explore. And all share in the excitement of new beginnings, the anticipation of orientation activities that will immerse them in the Emory experience, and an urgency just to see it all begin. When applying to college, Chelby Sterling admits that it was her friend, Cydni Holloway, who pushed her to dream big. Both girls attended Benjamin Franklin High School, a top-ranked charter high school in New Orleans, Louisiana. And both had participated in College Track, a program that provides high school students with resources and support toward achieving a college education. Growing up biracial, Sterling had an interest in black culture and identity, and imagined pursuing political science, economics, African American studies or law school. But with an autistic brother, Sterling felt compelled to consider colleges close to home. When a mentor suggested that in order to make change in the world, she should first get out and see it, her friend Holloway concurred. “When she heard me saying that I wanted to apply locally, she told me, ‘No. You have just as much potential as I do,’” Sterling recalls. As for Holloway, from the time she was small, her parents insisted that she would attend college — even if they weren’t sure how they would pay for it. “Neither of my parents graduated from college, but they saw it as an important way for me and my siblings to have a better life,” she says. That dream was shaken in 2015, when her father, Daryle Holloway, an officer with the New Orleans Police Department, was shot and killed on duty. For months, Holloway struggled to dig herself out of a deep, emotional hole. Her father’s assailant was a felon with untreated mental health issues. Could access to treatment or better rehabilitation services in prison have helped? Could more acceptance of mental health care in the black community have made a difference? Those are the research questions that now motivate her. While both girls applied to a wide range of top universities, in the end, they both chose Emory. “We attended 'Essence of Emory’ weekend and completely fell in love,” Sterling says. Now Holloway and Sterling are beginning preparations to do just that, moving into Longstreet-Means Hall as first-year roommates. Throughout high school, Kellen Sandvik was never content with sitting on the sidelines. An accomplished student — he comes to Emory as a Woodruff Scholar — Sandvik was also a joiner and a doer. Whether serving as president of the school’s math, philosophy and “Do Something” clubs, or founding the not-for-profit organization “Pass-A-Bag,” which creates care bags to distribute to the homeless, Sandvik was happiest engaged and busy. In fact, the opportunity for student engagement was part of what attracted him to Emory. “A friend had applied here, really liked it and recommended it,” he says. “When an admissions officer visited my school, I learned more about the environment and the opportunities and applied Early Action,”says Sandvik, of San Diego, California. At the moment, he’s interested in majoring in math and quantitative sciences, but he’s also considering the possibility of a focus on finance. And he’s already diving into all Emory has to offer. Just days before move-in, the avid outdoor adventurer joined other Emory students on a three-day backpacking trip in the North Georgia mountains through SOAR (Student Outdoor Adventure Retreat), a program that provides a chance to meet other first-year students and learn about Emory from older students. “At this point, I’m just excited to meet people,” he says. When she was 7 years old — not long after her family had moved from India to Georgia — Maya Aravapalli recalls visiting the Michael C. Carlos Museum with her family. Later, her father made a prediction: “Maya, this would be the perfect environment for you and your brother,” he said. So when it came to college, “Emory was my first choice,” says Aravapalli, of Alpharetta, Georgia. In high school, Aravapalli’s extracurricular service work revolved around Girl Scouts. For her Gold Award, the Girl Scouts' highest honor, she raised $7,000 to provide desks and chairs for schoolchildren in Karnataka, a state in southwestern India. “When we would visit over the summer, my brother and I always volunteered in schools and I noticed the schoolchildren were sitting on concrete floors,” she says. Growing up in Covington, Georgia, it seems that Eric Lee was never more than a few minutes away from Oxford College’s leafy campus. “I knew it was there, but I never thought I would be going there,” Lee laughs softly. But with the help of the Martin Luther King Jr. Scholarship — and some keen skills on the basketball court — Lee is doing just that. He’ll play basketball for Oxford College while beginning his first-year studies. Funded jointly by Oxford College and the Newton County King Scholar Fund, the full-tuition scholarship is awarded annually to a Newton County High School student interested in attending Oxford College; the award continues to Emory College, Goizueta Business School or the Nell Hodgson School of Nursing. Living so close to Oxford College, Lee says it was impossible not to know of its reputation for academic excellence and being part of “one of the top 20 universities in the nation with regards to research and the liberal arts,” he says. Nine years of playing competitive volleyball gave Kaeli Thompson an appreciation for the intricate balance between mind, body and nutrition — how the right foods can feed the body and fuel performance. In fact, it was through traveling for national volleyball tournaments that she began to consider attending college in the southeastern U.S. “I have some family in Tennessee and had played in tournaments around the Southeast, and I just fell in love with the people,” says Thompson, who is from San Diego.